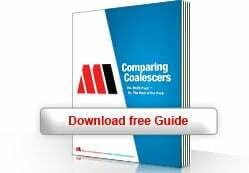 Mercer is one of the very few separator manufacturers that continues to provide a two-stage distribution system in front of the coalescer. Our two-stage distribution baffle system is designed to assure evenly dispersed flow over the entire entry area of the coalescer — offering superior results within the coalescer. 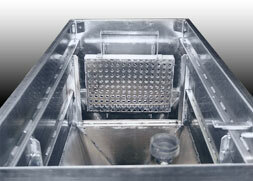 Flow enters a distinct inlet section, in the front end of the separator, which is designed to break up the velocity of the inlet flow entering from the inlet fitting. This is especially important when the influent is pumped into the unit. Once the energy and velocity of the inlet flow has been reduced, the flow then enters the first stage of the flow distribution plates. Careful control of the velocity through the first stage baffle assures even flow distribution through all areas of the baffle, helping to ensure even flow throughout the entire entry area of the coalescer. Equalized flow velocity entering the coalescer is critical in achieving efficiencies that approach the design potential of the coalescer per Stoke’s Law. The second stage of the inlet flow distribution baffle system further distributes flow and is designed for efficient eddy current reduction. Momentum and kinetic energy are further dissipated in this second stage. This efficient flow distribution and eddy current reduction design further enhances operational efficiencies, thereby providing significantly better results in the field from typical designs that only offer inefficient flow changing elbows, tees or velocity head diffusion baffles. Without an efficient flow distribution system ahead of the coalescer, inlet flow will enter different regions of the entry area of the coalescer with widely differing velocities. 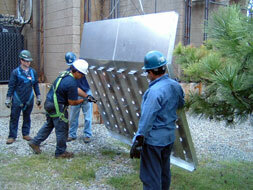 The inlet end of the coalescer will then act as the flow distribution system. The front end of the coalescer, by default, becomes a flow distribution system and thereby uses up the actual usable plate surface area required for optimal separation. 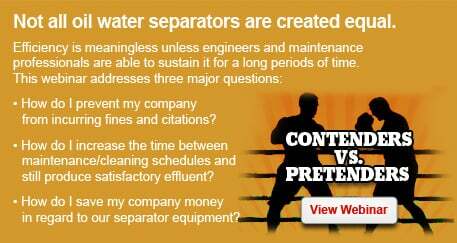 Other Designs: The vast majority of separator designs typically have only a 90° or 45° elbow, tee or an angled plate as a velocity diffusion system. At best, these are poor flow distribution systems and they put undue “strain” on the coalescer—causing unnecessary inefficiencies in the coalescer section (the coalescer is the most critical step in separation that produces low oil effluent concentrations). 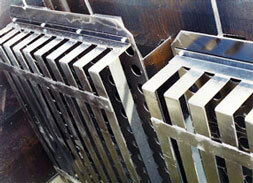 Our distribution baffles are also easily removable without entering or emptying the separator. 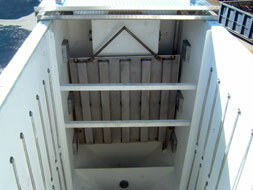 Mercer is the only major manufacturer offering removable two-stage distribution baffles. Mercer is one of the very few manufacturers that continues to supply an outlet flow distribution baffle, as well (what is good for inlet distribution is also good for the outlet distribution). 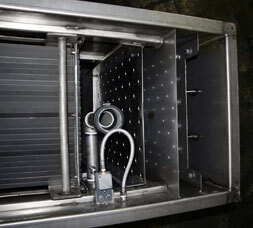 The outlet distribution baffle is a carefully designed single-stage, perforated baffle placed after the coalescer and works in combination with the inlet distribution baffle. 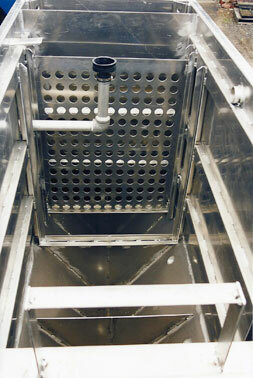 The outlet distribution baffle helps maintain uniform flow throughout the separator, and prevents “coning” (short-circuiting flow from the upper portion of the coalescer). With efficient flow-distribution baffles on both the inlet and outlet sections, "dead spots" within the coalescer are virtually eliminated. 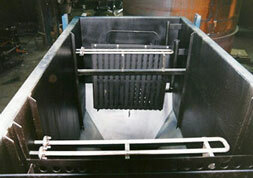 The outlet distribution baffle is a single-stage, perforated baffle and works in combination with the inlet distribution baffle. The outlet distribution baffles help maintain uniform flow throughout the separator, and prevents “coning” (short-circuiting of the upper portion of the coalescer). With efficient flow distribution baffles on both the inlet and the outlet, unused areas of the coalescer are virtually eliminated. Similar to the inlet distribution baffles, the outlet distribution baffles are removable without emptying the vessel, and can be removed without personnel entering a “confined space” area. Other Designs: Mercer may be the only manufacturer left offering and outlet distribution baffle. The coalescers have Nylon or Teflon sealing strips, front and back, to prevent hydraulic leaks between the coalescers and the tank. As leaks are prevented, effluent efficiency increases. Few other designs incorporate reusable sealing strips to prevent hydraulic “short circuiting”.